Episode #101: Who Will Be The Chosen One(s)? The Realm Recap returns this week and we’re in full “con mode” as more and more exclusives have been announced. Hasbro as lifted the veil on theirs with the reveal of three 6″ Black Series items not to mention the return of the Fan’s Choice poll! Hasbro has also shown off some new products that we can expect to see in aisles this fall. Funko and Sideshow/Hot Toys have even more announcements this week with new POP!s hitting stores and preorders going online. Finally, Flyguy and I run down the latest book announcements including Chuck Wendig’s Aftermath: Life Debt which has clear ties to The Force Awakens. All of this and much more on Episode 101 of The Realm Recap. We’re sure you’ve seen or at least heard of the recent controversy surrounding some racy images published by GQ Magazine involving a couple Star Wars characters. We won’t be publishing the images or the links here due to the varied ages of our readership, but Lucasfilm has issued the following statement. It’s not surprising that GQ would want to capitalize on the cultural cachet of Star Wars, but Lucasfilm and Disney did not authorize, participate in or condone the inappropriate use of our characters in this manner. 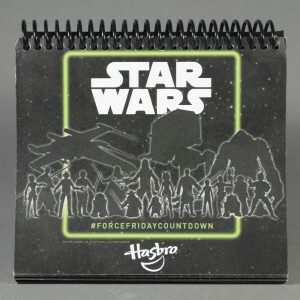 The Yakface Toyguide updates resume today with a special addition focusing on the #ForceFridayCountdown Promotional Calendar sent out by Hasbro and Hunter PR to various collector/news sites. This calendar counts down the days until Force Friday, September 4, 2015, when official merchandise for Star Wars: The Force Awakens hits store shelves. Each page features a factoid relating to the date or product shown. Click on through to check out the calendar in its entirety and reflect on almost 40 years of Star Wars merchandise from Kenner and Hasbro. Again, we’d like to thank Hasbro/Hunter PR for this great piece. To celebrate the return of Star Wars comic books to Marvel Comics, Hasbro Toys and Diamond Comic Distributors have created a unique Star Wars #1 – Hasbro PREVIEWS Exclusive Variant, Toy Fair Edition, a special variant that will be limited to just 10,000 copies! September Release for Episode VII Product? MakingStarWars.net has posted an article recently describing several new books tied to the release of The Force Awakens. Within the text, it appear that it is planned have the books released in conjunction with the first wave of Disney Consumer Products “toys to bed spreads and everything in between” sometime in September 2015. Thanks to C.C. Russell for the heads up. USA Today has posted a great video and article for the upcoming children’s book Star Wars: The Adventures of Luke Skywalker, Jedi Knight featuring the art of the late Ralph McQuarrie. It is available for pre-order now with a release date of October 8. I picked up a new Star Wars Rebels book today from Toys”R”Us titled Star Wars Rebels: Head-to-Head which matches up characters and vehicles from the new series. It contains a lot of new characters and vehicle details as well as plot points for the series. I posted a sampling of them on our Facebook page, but to remain sensitive to spoilers, I cropped out the plot info from the images. The softcover book is available now for pre-order on Amazon with a release date of Aug. 26, but you might be able to find yours in-store early as well. StarWars.com has posted a new book trailer via their YouTube page for their Star Wars Storyboards: The Original Trilogy by J.W. Rinzler coming to stores on May 13. Star Wars Storyboards: The Original Trilogy collects over 1,200 storyboards for the first time ever. As seen in this debut trailer, they were an essential part of the filmmaking process, helping visualize A New Hope, The Empire Strikes Back, and Return of the Jedi — including the Death Star trench run, the Battle of Hoth, and Luke Skywalker’s final duel with Darth Vader and the Emperor. Star Wars Storyboards: The Original Trilogy features a foreword by Joe Johnston, an introduction by Nilo Rodis-Jamero, and exclusive commentary by Joe Johnston, Nilo Rodis-Jamero, Alex Tavoularis, Paul Huston, and Dave Carson.